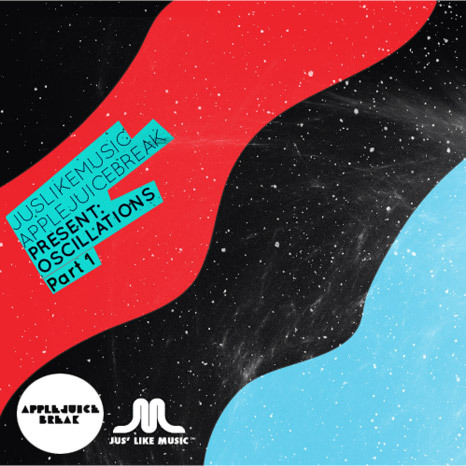 "Oscillations is a FREE digital compilation presented by Jus Like Music and Apple Juice Break designed to help spread the word of amazing music by amazing artists from the genres of hip-hop, electronica, neo-soul, dubstep and anywhere in between! Featuring primarily exclusive, or at least previously unreleased material, each of the two parts contains around 20 tracks. The release will also come packaged with a pdf booklet full of info on the artists, plus a showcase of art by an array of incredibly talented visual artists"
This is an absolute must for any fan of future hip-hop / EDM / glitch hop/ beatz and heavy bass. Honestly speaking, I don't recognize more than half of the artists, but this just adds to the charm of this quality compilation. The package starts from a real bomb by Broken Haze hailing from Tokyo, Japan. Block will take your breath away with the sheer power of unrestrained beat and synths, sounding like a joint jam by Glitch Mob and Rustie. Om Unit from UK (well this name you definitely heard!) in equally successful tune goes deeper and darker, while Chairman Kato from London again rides the path of neon synths and heavy bass with lots of bleeps and occasional lazers. Well there are too many tracks to describe them in detail, but an overall quality is really astounding for this type of compilation. Apart from the three above mentioned killers, other highlights were provided by Vital, Decepticon Bootleg Machine, le N?KO, Bluntspeakers and BUG. Great food for your mind and body, already stoked to hear pt. 2!! Go to the bandcamp site and download the entire package for free.